Avocado and Egg Potato Salad is one of our favorite side dishes. The combination of flavors in this salad is just perfect. It is such a tasty and filling salad that I sometimes have it for lunch. Healthy can definitely be scrumptious! Since this salad is served cold, you can make it beforehand for parties too. Just make this salad to a dinner party you are invited and get ready for compliments. Avocado and Egg Potato Salad is actually a wonderful twist on classic Turkish potato salad. It is a must to add thinly sliced onion and sumac in a typical Turkish potato salad. Greens in the salad are optional, you can just go with your favorite herb or whatever you have in hand. I mostly use green onions and parsley, but other herbs like fresh mint or dill are fine too. You can even use them all. Another thing that you must have in a potato salad for me and many people in Turkey is hard boiled eggs. Well, I can add eggs to anything in any form. I always have a craving for eggs. And they make a potato salad much tastier and healthier with a nicer look. A perfect potato salad must have a tangy flavor. Sumac gives a nice tangy flavor, but I think lemon is still needed for some more tartness and moistness. The quality of olive oil in a good potato salad is really important because I think you must feel that extra virgin flavor and scent of it in the salad. And now I have another must-have ingredient in a potato salad: Avocado. Believe or not, I really regret all those years in my life without avocado. It is a fantastic food and the recipes with it are endless. If you love it as much as I do and look for easy avocado recipes, you can download my ebook with avocado recipes simply by subscribing to Give Recipe’s free weekly newsletter. 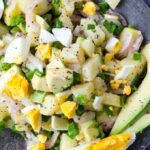 Avocado and Egg Potato Salad has already become our favorite potato salad version, but I’m not sure about its name here. Some of my options are Potato Salad with Avocado and Egg, Avocado Potato Salad with Egg, Avocado Egg Potato Salad or Avocado and Potato Salad with Egg. I want the focus on potato since this is basicly a potato salad. Which one would you choose? I’d love to hear how you would call this salad. Please share it in the comments section. Well, I’m telling you about how to make a perfect Avocado and Egg Potato Salad in this post. I assume that you know how to cook potatoes for a salad. If you need tips on how to cook them perfectly, check out Joanne’s and Adam’s Potato Salad Recipe. 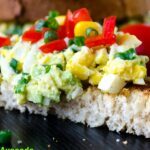 Tangy potato salad with eggs and avocado. Put potatoes in a large pot filled with water. Add 1 or 2 teaspoons salt into the pot. Boil the potatoes until you can easily insert a fork in them. It takes about half an hour. Put finely sliced onions in a large bowl. Sprinkle sumac and salt on it. Mix it well with your hand, squeezing the onion slices so that they release juice and get the color of sumac. This is a way of removing their bitterness. Drain potatoes, wait for a few minutes in cold water. Peel and dice the potatoes into the bowl. Toss in green onions, avocado and eggs. Add in olive oil, lemon juice and black pepper and stir until combined well. Taste and add extra salt or lemon juice if needed.